At some point, you are going to need professional roof cleaning in Cape Cod. The tricky part is trying to determine which company to work with. 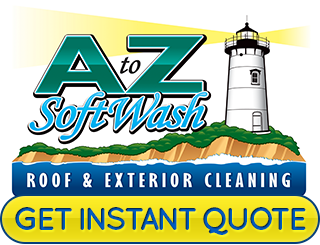 All you have to do is ask around and you will hear the same answer over and over – A to Z Softwash. We have earned the title of local leading service provider and for a number of good reasons. First and foremost, we are dedicated to providing our clients with the best in quality service. This means going the extra mile in order to deliver the best in quality. Getting a clean roof is about much more than just making your home look better. It is about protecting your rooftop from substances that can collect and begin to damage your roofing material. 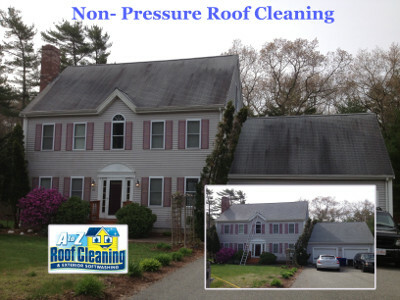 Let our Cape Cod roof cleaning experts help improve the look and condition of the exterior of your home. This is an ideal way to prolong the lifespan of your rooftop. Algae, lichens, moss and other substances can form. They not only look unsightly, they can eat away at your shingles. This can lead to the need to replace your roof much sooner then you should have to. Believe it or not, that algae can also impact the energy efficiency of your home. This impacts the heat retention which makes your home hotter. The end result is that you will have to use your air conditioner a whole lot more which runs up your utility bills. Of course this also negatively impacts the property value of your home. Curb appeal is a big factor in property value and a dingy looking roof is not going to help that at all. Not to mention, what kind of first impression is your home going to make on guests who arrive to see a dirty rooftop with black algae streaks? You can stop this and reverse the effects by getting regular roof cleanings. Kill that algae and mold while improving the look and the condition of your roof. 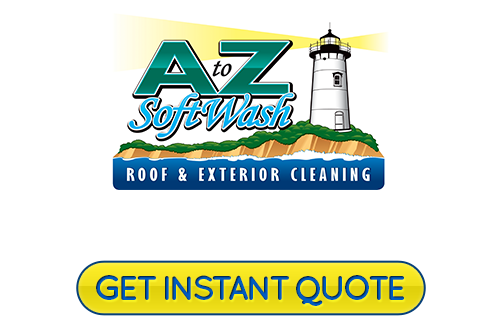 Locals know that the name to entrust, for roof cleaning and more, is A to Z Softwash. We take great pride in the exterior cleaning work that we do. Let us show you firsthand how we have earned the flawless reputation that we have as the local source for roof cleaning in Cape Cod. We look forward to working with you and helping you get the results that you deserve. If you would like an estimate for roof cleaning in Cape Cod, please call 508-209-7795 or complete our online request form.